Indirectly referred to as a parody of Dwarf Fortress, this game purports to be the only fantasy colonization simulation you'll ever need. For those who hadn't figured it out yet … yes, this game is a joke. 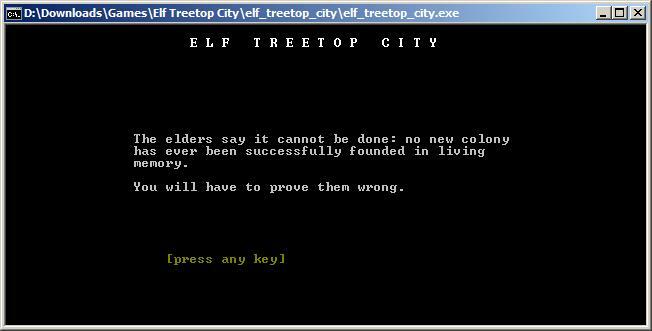 The elves refuse to log down any trees (What sane elf would do such a thing?!??!!) which means no lumber for buildings. And when you build sleeping cots out of branches, the elves fall asleep high up in the tree … and then roll over and fall out and die. Alternately you can just let your elves wander around the trees attempting to be gardeners or fairy-wranglers or whatever. 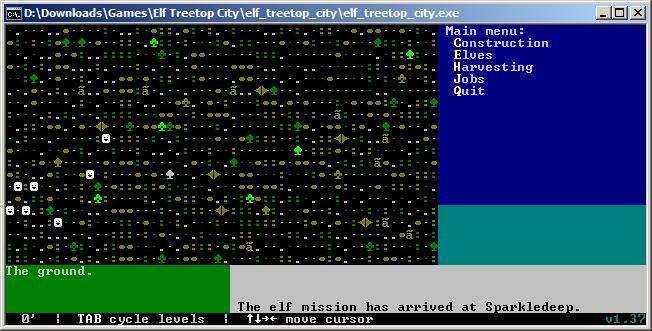 Elf Treetop City - A TIGForums post on the game. Quickstart guide - A guide written by one player to help others learn how to play.